A denture is an appliance that is inserted in the mouth to replace natural teeth. Dentures also provide support for the cheeks and lips. 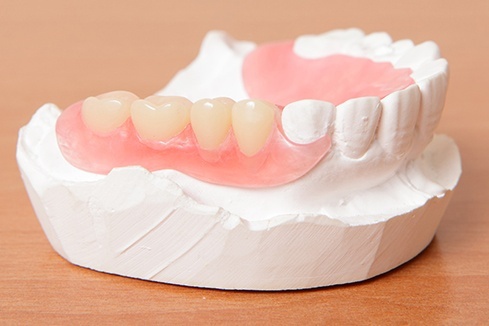 A conventional denture is fabricated after all teeth have been extracted and the soft tissues have healed. An upper denture has acrylic, usually gum-colored, that covers the palate (roof of the mouth). The teeth are made of plastic, composite, or a combination of those elements. Dentures can be made to fit over endodontically treated teeth and a complete denture can be attached to dental implants for a more secure and natural fit. Dentures, over time, will wear down and need to be replaced or relined to keep the jaw alignment normal and healthy. The alignment will slowly change as the bone and gum ridges shrink due to the lack of teeth. Regular dental examinations are still important because the oral tissues need to be checked for disease or change.